A group of about 30 students, all wearing black clothing, assembled quietly by the U statue near the Foote Green Wednesday afternoon. Suddenly, over a megaphone, a single voice commanded the demonstrators to “die,” and the students dropped to the ground in unison. This demonstration was a precursor to a larger protest that began at 2 p.m. on the Rock. A group of more than 200 students protested the grand jury decision not to charge Officer Darren Wilson for the shooting of Michael Brown in a rally called #BlackLivesMatter. The march’s stops included The Rathskellar, Einstein’s Bagels, the Ashe Administration Building and Dooley Memorial. Some protesters gave impromptu performances at these stops, such as singing and spoken word poetry. However, some students felt disrupted by the performances. One anonymous law school student found the demonstration to be an unwelcome surprise while studying for finals near Einstein’s Bagels. After the march, protesters participated in another Die-In, stopping students on their way to class. The demonstration took up the entire surface of the Rock, bringing more attention to the cause and attracting passersby to join in. The final event was a speech given by Phillip Agnew from Dream Defenders, an organization dedicated to raising leaders and fighting oppression. As the crowd dispersed, protesters were invited to sign NAACP petitions that seek a federal civil rights investigation against Wilson. 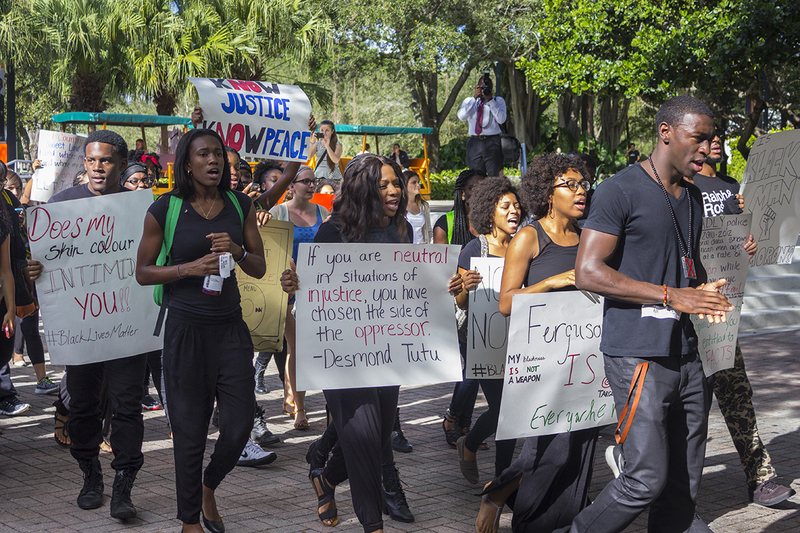 Overall, the protest received mixed reactions, from avid support to disapproval. Marius Dicpetris, a doctoral Musical Arts student, believed the protest was necessary. However, an anonymous student who preferred to be cited as “a white male from the business school” felt that the protesters misunderstood the true nature of the case. Due to the controversial nature of the protest, anonymity was a common theme. Disputes over the protest overtook the anonymous social media application Yik Yak, filled with a combination of critical debate and racial slurs. Freshman Matthew Marin came forward and said that he submitted a post to Yik Yak criticizing the demonstration. The post argued that “the [#BlackLivesMatter] slogan is focusing on the wrong thing” because “human lives matter.” Within minutes, 45 people “upvoted” and “downvoted” the post, leaving a net number of four upvotes. It epitomized the polarized response to the rally. In fact, Morton almost never learned that #BlackLivesMatter was taking place because signs advertising the protest were taken down, even though they were approved by Dean of Students Ricardo Hall and the protest was school-sanctioned. Despite these obstacles, Morton was impressed by the size of the turnout for the event and optimistic about future protesting efforts that will take place during Art Basel Friday. The idea to protest on the UM campus was conceived by Guerdiana Thelomar, the president of Planet Kreyol (PK). Thelomar followed the Michael Brown case from the beginning. More than the ruling itself, she was shocked by the public reaction to the ruling, as well as the way the investigation was conducted. “When the decision was announced I was so disappointed and upset—not only because of the way this entire case was handled from beginning to now, but also because of all of the negative, ignorant and hurtful comments that people were making following the decision,” Thelomar said. As a result, Thelomar moved to action. She began a GroupMe chat to mobilize others toward making a change on campus. Among those she contacted, Hulya Miclisse-Polat and senior Philisha Mesidor stepped forward as leaders. Mesidor was motivated because of an empathetic response to Brown’s case. “Michael Brown reminded me of many people that I know, and to imagine that their bodies and lives can also be disrespected in that manner is disheartening,” Mesidor said. Meanwhile, Miclisse-Polat saw the need for greater social change. Jackie Yang contributed to this report.